A BBC investigation on the Turkish textile industry found that facilities producing clothing for major brands have been exploiting children and refugees to do so. Fashion companies like British-based ASOS and Marks & Spencer have been accused of outsourcing from factories that use child labor. These children work 60-hours a week and are unable to attend school. When confronted with the issue, Marks & Spencer found the reports ‘extremely serious and ‘unacceptable’. Based on these discoveries, Marks & Spencer has offered legal employment to refugees, and promised to do whatever they can to ensure it never happens again. 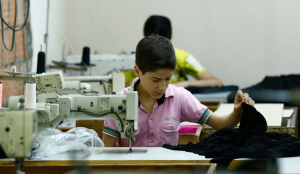 ASOS on the other hand denies that child labor occurs in any of their approved factories and claims the facility shown in the BBC report was unapproved outsourcing. One of their contractors who had been committed this unapproved outsourcing, Hazar Teksil, was dropped by ASOS when child workers were found. The report also found the unfair treatment of refugees. Turkey hosts over 3 million Syrians who have fled the conflict. With limited opportunities for employment, these refugees are easy prey for exploitation and work for far below minimum wage sometimes. The undercover report on a facility producing clothing for Mango and Zara found employees working 12-hour shifts in dangerous conditions. Zara’s response was to blame it on a sub-contractor working without their knowledge. Mango on the other hand audited the factory in June 2006 and found that it not to comply with their code of conduct, so they are giving them until the end of the year to make the necessary changes otherwise they will be no longer serviced. Regardless of whether these companies knew about the child labor and refugee exploitation or not, I believe that they are responsible for the conditions their employees work in and who these employees are, therefore, they should take full responsibility for the events and conditions experienced under their supervision. It is their corporate responsibility to their employees and other stakeholders to ensure the safety of their workers.